When you hear the name Sony, you probably think of TVs, cameras and laptops. Maybe even Walkmans, if you’re feeling nostalgic. But smartphones and tablets? Not so much. That’s because, compared to its competitors, Sony hasn’t released many mobile devices, especially in the U.S., and the ones that do make it to market are either flawed or expensive or both. 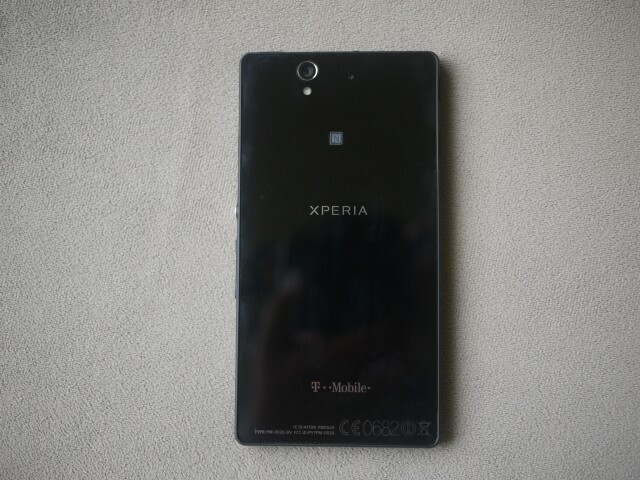 But the company is looking to change that, starting with its Xperia Z series. 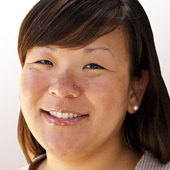 My colleague Katie Boehret already reviewed the Xperia Z tablet and found it to be a serious rival to the iPad. And after a couple of weeks of testing, I can now say that the Xperia Z smartphone is also a solid competitor to current high-end Android smartphones like the HTC One and Samsung Galaxy S4. Available exclusively from T-Mobile starting July 17, the Xperia Z offers a gorgeous display and smooth performance. 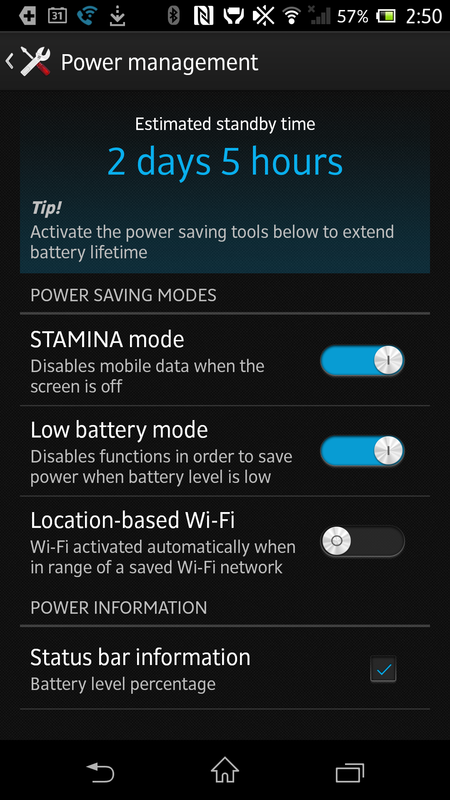 It also includes a power-saving feature that contributes to good battery life, and it’s water-resistant. The Xperia Z costs the same as the HTC One and Galaxy S4 at $100 down with 24 equal payments of $20 a month on T-Mobile’s Simple Choice plan. On paper, the three phones are pretty evenly matched, but due to some issues with design, camera and call quality, I preferred the HTC One. 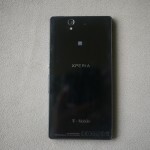 The Xperia Z looks like a mini version of the Xperia Z tablet, which is a good thing. It’s sleek and solidly built. If the standard black color is too boring for you, T-Mobile will also offer a purple version of the handset online. The phone has a five-inch, 1,920 by 1,080-pixel touchscreen. It shows slightly less pixels per inch than the HTC One (468ppi versus 443ppi), but I still found it to be sharp and bright. I was able to watch videos and read text without problem. Because of the larger display, the Xperia Z is a bit on the bigger side. The smartphone measures 5.47 inches tall by 2.79 inches wide by 0.31-inch thick, and weighs 5.15 ounces. It’s very similar in size to the HTC One and Galaxy S4, and I could still fit into my back pants pocket. That said, it’s not as comfortable to hold as the One or the Galaxy S4 because it has sharper edges. 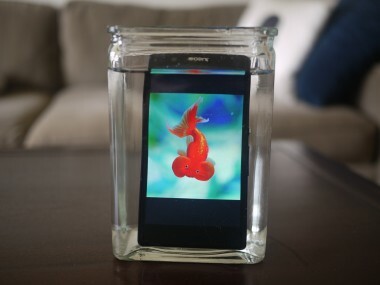 One thing the Xperia Z has going for it is that it’s water-resistant in up to three feet of water for up to 30 minutes. But there’s a caveat. You have to cover all the phone’s various ports — microUSB, power connector, SIM and SD card slots — using the attached protectors. This may not be very helpful if you’re accident-prone or clumsy, but the phone does remind you to do so every time you unplug it from the charger. 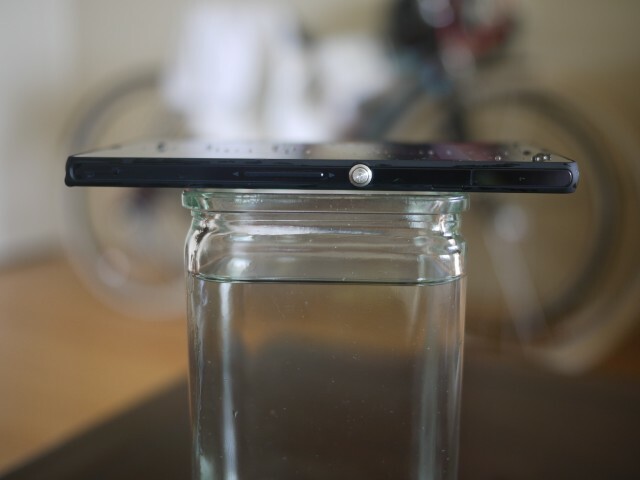 I tested out the feature in my kitchen sink and at the beach, and the Xperia Z worked fine after a few dunks. 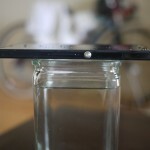 The touchscreen works even if your fingers are wet, but not when submerged underwater. 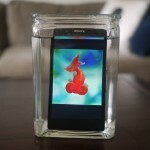 It would be nice if the phone had a dedicated, physical camera button, so you could take pictures and video underwater. As a bit of a workaround, you can activate the video camera before jumping into the water, but you can’t take still photos. The Xperia Z’s main 13-megapixel camera was a bit of a mixed bag. On the positive side, it has a feature called Superior Auto that automatically detects the scene and adjusts settings to capture the best picture possible. For example, when I tried to take a close-up of some flower petals, it went into macro mode and produced a sharp picture filled with detail. On the downside, the camera didn’t always produce the best pictures. Dark environments and scenes where the light source was behind the subject still proved to be a problem, as pictures turned out discolored or grainy. 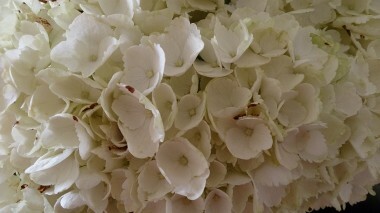 On several occasions, there was also slight delay when trying to launch the camera from both the lock- and home screens. In general, though, I experienced swift and smooth performance from the Xperia Z. The smartphone is powered by a quad-core processor from Qualcomm and runs Google’s Android Jelly Bean 4.1 operating system. Unlike Samsung, Sony hasn’t fiddled with the user interface too much, and I found it clean and easy to use. But the company, along with T-Mobile, preloads the handset with a number of software extras, such as Sony Select (an app-recommendation service) and T-Mobile TV. I didn’t find any that I’d use on a regular basis, and there’s no way to uninstall them. Call quality was mostly clear and sharp, but I found volume was a bit low. I really had to get the earpiece in the right spot to hear my friends without problem. 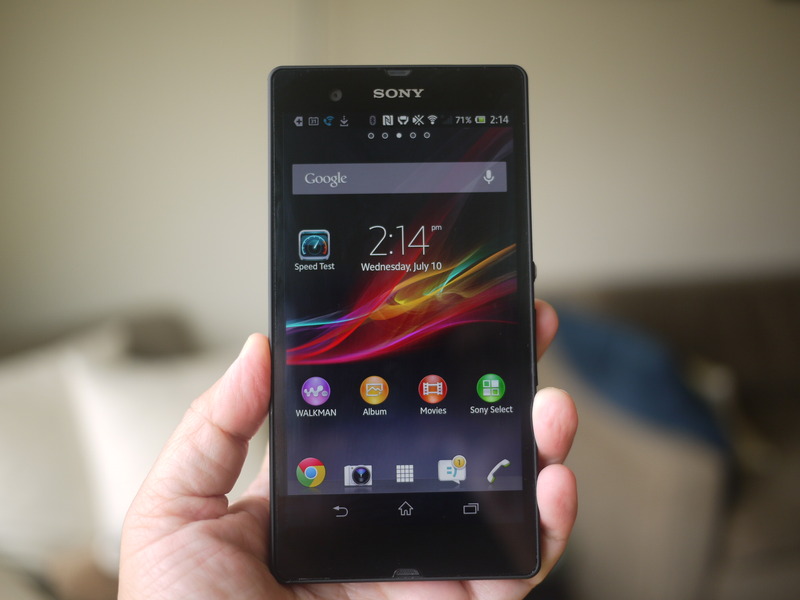 The Xperia Z supports T-Mobile’s new 4G LTE network, which is now live in 116 metropolitan areas. Here in San Francisco, where 4G LTE is available, I averaged download speeds of 8.13 megabits per second and upload speeds of 3.26Mbps. By comparison, I averaged 22.13Mbps down and 14.48Mbps up on my iPhone 5 on AT&T’s 4G LTE network. Battery life is solid. With moderate usage, where I used the phone to check email, social networks, browse the Web and watch a couple of video clips, I got a full day’s use out of a single charge. 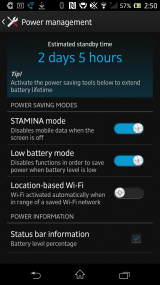 But the Xperia Z also has something called Stamina Mode, which disables your Wi-Fi and data connection when the screen is off to conserve power. (There is a whitelist where you can add apps to bypass this rule — if you want to continue to receive email, for example.) With Stamina mode on, I was able to go a day and a half before needing to recharge, which was great. 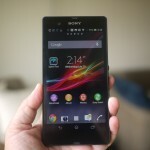 Sony may be playing a game of catch-up, but the Xperia Z shows that the company can make a good Android smartphone. The HTC One would still be my top overall pick, but for those who really put a premium on battery life or want a water-resistant phone, the Xperia Z is worth a look.